Left: the Contax S, launched in Dresden in 1948; Right: the Contax IIa, launched in Stuttgart in 1950. It was the autumn of 1948. Germany had been divided into a number of occupied territories, each under the jurisdiction of one of the victorious Allied Powers. The Allies themselves, however, were by now no longer friends: the relatively new phenomenon known as Cold War had reached its hottest point, the western powers having agreed in May to the formation of a separate West German state, and the Soviet Union countering in June with a blockade of the western zone of the city of Berlin, which was located deep within the Soviet occupation zone. America’s response in return was the famous Berlin Airlift, flying tons of supplies over the Soviet roadblocks to feed the trapped citizens of West Berlin. The blockade and the airlift continued into May of 1949; the intense hostility between the Eastern and Western portions of Germany continued for decades. Caught in the middle of it all was the proud firm of Zeiss-Ikon, the prestigious conglomerate which had been formed in 1926 by a merger of some of the oldest and finest optical houses in Germany. With major installations in Kassel and Stuttgart in West, and Dresden and Jena in East Germany, as well as in Berlin itself, the giant company found itself split right down the middle. At first a sort of make-the-best-of-it attitude prevailed, with the two resulting firms both going back to work with the facilities left at their disposal, but as political tensions mounted, so did animosity between the two branches of the Zeiss-Ikon concern. It was into this inhospitable atmosphere that the Dresden-based group introduced, at the St. Erik’s Fair in Stockholm, Sweden, the first postwar Zeiss-Ikon design and one of the most significant cameras in recent history: the Zeiss-Ikon Contax S. For Zeiss-Ikon Dresden, deprived of key personnel, facilities, and the benefits of a free marketplace, to have gotten anything significant into production at all would seem a miracle; the fact that such an advanced and original design was implemented a full year ahead of the West Germans’ Contax IIa is simply incredible. And, while the Contax S’s specifications may not seem too fancy today, camera design was a different world in 1949, and we owe much to the East Germans for features that we now take for granted. We generally think of the Contax S, with its revolutionary eye-level pentaprism viewfinder, as the first modern 35mm SLR. It was that, of course, but in the context of its time, competition and heritage, it might also be thought of as the ultimate eye-level viewfinder camera. Here was the single-eyepiece viewing and focusing that had been the hallmark of the Contax name since 1936, and that in 1949 was still yet to be achieved by Zeiss-Ikon’s competitors in Wetzlar; the elaborate array of accessory viewfinders, reflex housings, and complicated close-focusing devices which made up the bulk of the Leica and Contax “systems” were all rendered obsolete at a stroke by the new eye-level, parallax-free through-the-lens viewfinder. (It’s interesting to note that the Contax S, the first Contax to come from the factory synchronized for flash, was also the first to lack what we think of today as a “flash shoe”: in those pre-flash days, the shoe was used to attach accessory viewfinders, which the new SLR didn’t need.) The sophisticated prism which made this new viewfinder possible would seem a logical product of a company whose rangefinders had represented the state of the art of prism design and construction since the mid-1930s; and the viewfinder image, while admittedly dim, was highlighted by a bevel-edged groundglass which created a “bright frame” effect at the edges of the field, recalling in a general way the Albada sports finders produced by Zeiss in the prewar years. The Contax S shows definite signs of its relationship to the prewar rangefinder Contaxes; its length and height dimensions are nearly identical to the Contax II, and its lines are about as similar as could be expected from an SLR (the similarity becomes striking when the meter-equipped versions are compared). The die cast body is similar in construction and the internal mechanisms reflect a modular approach similar to that taken with the earlier Contaxes. There are many areas, however, in which the S departs markedly from prior Zeiss-Ikon practice; in some, there seems to be no precedent at all. The use of a screw thread lens mount, a right-hand focusing helical (and a double helical at that, as opposed to the single helicals typical of Contax rangefinder lenses), and a clockwise-rotating takeup spool all seem out of character, particularly as the latter precludes the use of the established Contax cassette for two-cartridge loading. But the most obvious departure from noble Zeiss-Ikon tradition was in the abandonment of the vertical, brass slatted shutter in favor of an ostensibly conventional, horizontal cloth type. Sacrilegious as this may seem, it must be remembered that the Contax II/III shutter was not without its foibles, notably breakage of the cloth ribbons and the lack of an interlock to prevent its being triggered half-cocked, both of which were addressed in the Contax S design. The main argument Zeiss-Ikon had made against cloth shutters regarded their vulnerability to burning through, and this was at least partly mitigated by the presence of the mirror in the light path (at least, when the shutter was cocked). The original vertical layout of the Contax shutter would have been unacceptable in any case, due to interference with the mirror and focusing screen. At first brush, it may appear that the move to a horizontal cloth shutter would have resulted in a derivative design: a copy, perhaps, of existing Leica or Exakta mechanisms. This was not the case. The timing system in the Contax S is highly original, and considerably more complex than these earlier designs. In the Leica and Exakta, the timing of the high speeds involves no clockwork but is a simple function of the rotation of the shutter feed spool, operated by the force of the shutter drive springs; timing accuracy, then, is a function of shutter curtain velocity. For slow speeds in each case, a gear train is introduced to delay release of the second curtain: in the Leica, the power to overcome this resistance still comes from the curtain springs, while in the Exakta a separate timing spring must be manually wound up for each shot. In the Contax S, shutter timing is totally separate from the curtain springs, and a clockwork, driven by its own spring, governs the shutter at all speeds. As is the case in the Leica and Exakta, there is a distinction between fast and slow speeds; in the case of the Contax S, however, this does not involve “switching in” a separate gear train. Shifting to the “slow range” setting couples to the escapement rocker a long pendulum, to which a small weight is attached, adjustable by means of a set screw (while a godsend for repair and adjustment, the real reason for the Contax S’s unusual adjustment facilities is probably that the engineers, in their headlong rush to meet the deadline, didn’t know the proper settings until the camera was already in production, and so had to require hand adjustment of each camera on the assembly line). The addition of this pendulum to the rocker slows its oscillation by about a factor of 50:1 – thus, the position of 1 second at the “slow” index is identical to that for 1/50 in the high range. The relationship does not hold exactly as the speeds go up, probably in compensation for inertia at the highest speeds, so that the 1/20 setting corresponds to 1/500 rather than 1/1000. An interesting effect of the independent timing mechanism is that it doesn’t stop running when the shutter closes. Each winding sets the mechanism to run its full course, a 360˚ rotation of the visible-but-internal speed dial, in either 1/50 or 1 second, depending on the speed range in use. (The last few degrees of rotation occur upon removal of the finger from the release button, thus providing the “B” setting.) This extra travel isn’t noticeable in the high range where all speeds sound pretty much alike anyway, but in the slow range at, say, 1/20 second, the timer buzzes along for another 19/20 of a second after closing the shutter. It can be a bit disconcerting for your subject. The flash synch provided in the Contax S was also advanced and unique. Taking advantage of the two-range speed selector, the synch automatically switched from X in the slow range (1 – 1/20) to M in the fast range (this automatic coupling of flash synch type to shutter speed was adopted into the Contax IIa rangefinder camera when its “Color Dial” model was introduced in 1953). Also unique in the Contax S was the location of the flash connection: a terminal was hidden inside the tripod socket on the bottom of the camera, requiring a special adaptor. At the time of the S’s introduction, however, it should be remembered that the now-standard PC flash connection did not yet exist and every camera had its own unique system. In operation, the shutter seems to me to be quite a successful design. Since, like earlier Contaxes, its shutter speed dial rotates 360˚ in each cycle, it can be set either before or after winding. The thumbwheel that operates the inaccessible dial is a depress-and-turn affair, and a sheer delight to use compared to the lift-and-twist Contaxes and Leicas of the same vintage (it should be borne in mind that the Leica wouldn’t get a modern click-stop shutter dial for another half a decade, and the West German Contax never would). Speeds could be rapidly changed without even removing one’s middle finger from the shutter release. The same thumb that turns the wheel rests just as easily on the sliding speed-range shift button just below it on the back. Although, unlike rangefinder Contaxes, the speed dial does rotate during exposure, this is not a functional drawback (as it is in the screwmount Leicas) because the dial is not an external part. The thumbwheel is engaged only when depressed, and so does not rotate either during exposure or during winding. Winding effort is a bit high, owing to the fact that two sets of springs are being tensioned rather than one, but anyone who was used to handling a Contax in the late 1940s had already acclimated himself to a certain degree of stiffness in winding. The inability of the camera to accept existing Contax lenses and film cassettes was undoubtedly viewed as more of a problem by this group of users (although, in fairness, users of Contaflexes, Contarexes and Leicaflexes would later share in some of this same frustration). As far as servicing is concerned, the Contax S is a masterpiece of easy access and adjustment. All timing adjustments are made from above after removing the top cover, and curtain spring replacement, once inside, doesn’t even require tools. Resetting the timing spring is more difficult, but should seldom be necessary unless someone’s been in there taking things apart. The slow speed timing adjustment I’ve already mentioned is to the right, between the wind knob and the shutter speed dial, and setting curtain spring tension is a straightforward, two-screwdriver operation with lots of elbow room. Should the curtains need replacement (and they usually do at this age), the film gate comes off with 4 screws revealing the whole works plus the self timer. In terms of reliability, these are complex cameras and there are many things that can go wrong; but in practice, nearly all problems encountered can be traced to stiffened shutter curtains. The complex mechanical systems are usually still in good order and will perform properly once the curtains have been replaced. By this time, other changes were taking place: through a series of lawsuits, Zeiss-Ikon Dresden had been deprived of the use of first one Zeiss trademark and then another, resulting in Contax cameras marketed under a number of different names. 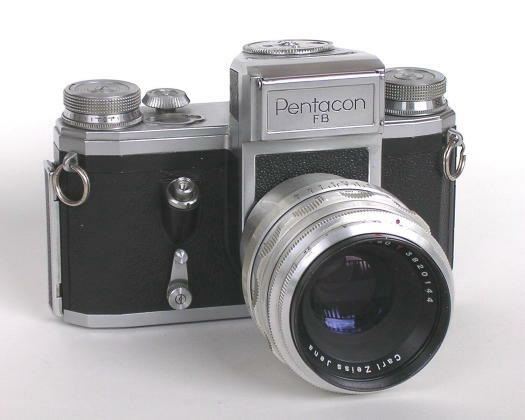 From the Model D on, all Contax models are also found with the name of Pentacon, standing for “Pentaprism Contax” (the name “Pentax” was also a Dresden trademark, which they licensed to Asahi Optical of Japan in 1954). The Model D itself was also marketed under a number of private labels, which can make for interesting collecting today. A few of the more common names are Hexacon, Astraflex and ConSol; there are others as well. 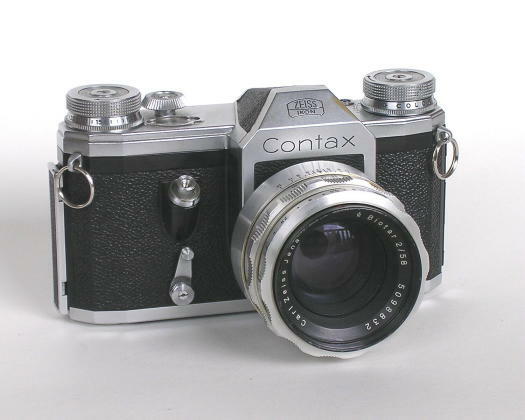 By the time the F series came along in the late 1950s, the Contax name was found only on cameras sold within the Eastern Bloc countries, with the great majority of production bearing the Pentacon name. Manufacture of the Contax/Pentacon 35mm SLR series was discontinued finally in the early 1960s after nearly 15 years of continuous production - as long a production life as the Nikon F.
A more detailed discussion of the operation and repair of this shutter can be found elsewhere on this website (see links below). For a properly written and researched history of the Contax S series, I highly recommend Alexander Schultz’s Contax S.